It’s Smarch I mean March! Hello, it’s the beginning of a new month and I’m still working on Poppy! Thankfully I will be done before the end of the day 🙂 but I wanted to post this image of my progress before I complete the painting! As you can see I continued working on the petals. Adding more contrast by bumping up the light areas and darkening the shadows. I think I’m pretty satisfied with the way they have turned out with the odd area that still needs work. Now that those areas are more dry I can go back and add a little more without the chance of the new layer being brushed off. I went back to the centre and added more colours. Various shades of violet and orange hues that are reflections of the petals. I still need to make the bright area of the centre “bright”. It has become faded after I added more shadows. I wanted to wait until that area has dried a little before I add the lighter tint. I also moved on to the two small poppies. Started working on their petals by delineating their shapes and adding contrast. 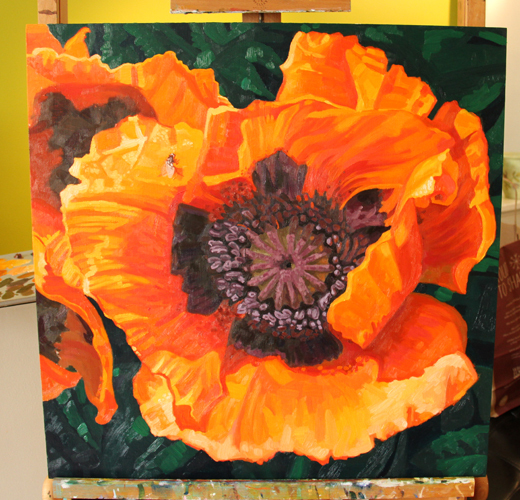 I avoided their centres until I was happy with the main poppy’s since I will need to use those same colours. Another element that I added was the fly! It’s gross I know but I think it makes for an interesting contrast with the beauty of the flower. Flies are still part of nature, even if we disagree! I’m still on the fence with it’s scale and whether or not I need to paint it smaller…will leave this conundrum until the end. Poppy in it's final stages!